When it comes to decorating your home, buying curtains represents a fun element with which you can play around. You have so many styles and designs from which to choose, and that's without even factoring in the types of fabric, colors, patterns or curtain rods. It's fair to say that after all of your designing, planning and comparing, you have a very clear vision in mind of what you want your curtains to look like. So, when they're finally up and they don't quite look right, you might feel disappointed or frustrated. What went wrong? Perhaps the fix is as easy as adding a bit of weight to the curtains. Why Do You Need to Weight a Curtain? Weighting a curtain can affect how straight the fabric hangs. If you have a specific shape in mind for how you want your curtain to drape, and you're certain you've chosen the correct fabric to achieve such a drape, a simple weight may be all that is missing. 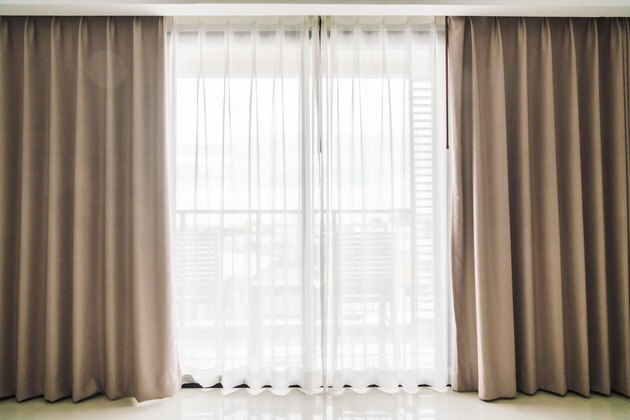 Of course, it may seem counterintuitive to weight a curtain when you want to achieve an airy, lightweight appearance for your curtains, such as when using a sheer fabric. Even a little bit of weight can make sure the curtains lay neatly instead of bunching up or getting out of line even if a strong breeze comes through the window. The pleats you envision will become a reality with weights. Without weights, they will look messy. It's a bit like ironing clothes in order to make sure they look really good. The bottom line is that for your curtains (even outdoor curtains) to look good, you need to add weights. Two main types of drapery weights exist: penny weights and chain weights. Penny weights actually look like buttons thanks to the four holes in the middle. This allows you to sew the weights securely to the hem of the curtain. An alternative is to put the weights in a fabric pouch that you then sew closed and slide into the hem. Chain weights consist of a link of weighted beads that is covered in fabric. Run this entire chain through the hem and cut it to size. You can hand sew a couple of stitches around the chain at either end of the hem to prevent it from sliding around if you lift the drape up. Because chain weights provide weighting along the entire bottom of the curtain, this is often considered the best way to weight curtains. Before you fret about your rusty sewing skills or how much it will cost you to buy special weights, take heart. As with anything else crafty, there are some great DIY hacks using things you already own. In fact, it might cost you just a few pennies — literally. This nonsewing method requires some pennies, paper clips and a hot glue gun. Glue a few pennies together to create a little weighted stack and then glue the stack to a large paper clip. Once the glue has thoroughly dried, slip the pennies into the corner hem of the curtain, securing the paper clip to the back edge of the hem. Repeat on each corner. If you need weight in the middle of the curtain, you can cut a little hole in the middle of the hem (taking care not to cut through to the front of the drape) in which to slide the pennies and secure the paper clip.